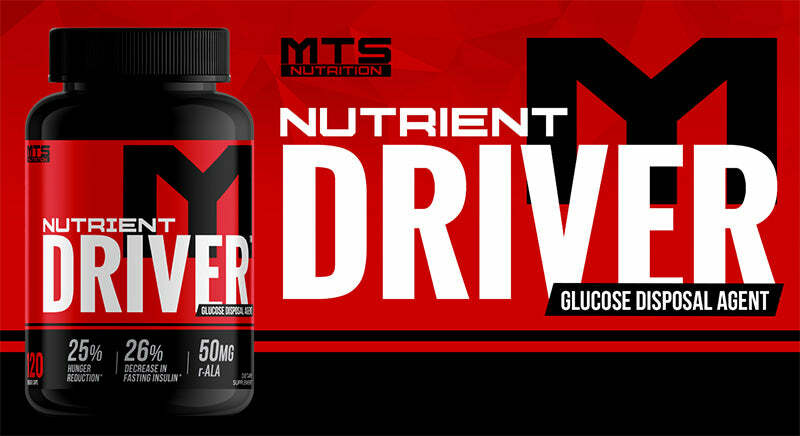 MTS Nutrition Nutrient Driver is the ultimate health and glucose disposal agent to help DRIVE nutrients into muscle, prevent fat storage and help you prevent deleterious health issues caused by blood sugar fluctuations. Nutrient Driver is meant to be take post workout and with higher carbohydrate containing meals to help with Glucose Metabolism & Insulin Resistance, Food Cravings, Mood, Appetite Control & Weight Management, Heart Health & Cholesterol, Energy Support, Brain Health, Immune System Health, Balances blood sugar, Utilization of carbs for energy and recovery, Control appetite and cravings, Reaction to stress, Healthy cortisol levels, Improve Insulin Action and Transport of Glucose (Carbs) to muscles and is an extremely potent water and fat soluble antioxidant. Produced by Nutrition 21, Chromax® Chromium is the premier form of supplemental chromium, backed by over 50 human trials. This trace essential mineral is essential to insulin, the body’s primary storage hormone, and helps maintain stable blood sugar levels, thus preventing the typical “crash” that follows high-carb meals.. Present in numerous plants used in Ancient Chinese Medicine, berberine is an alkaloid traditionally used for its anti-inflammatory and cholesterol-lowering effects. It’s also one of the most powerful, yet underrated, nutrient partitioning supplements around. But that’s not all. Banaba also impacts energy balance in the body, heightens insulin sensitivity, and reduces fat accumulation. [10,11] Suffice it to say, this is a must have ingredient in any nutrient partitioning supplement! Alpha Lipoic Acid (ALA) is a fatty acid found in the mitochondria of your cells that doubles as a potent antioxidant in the body. It aids in energy metabolism and has been shown to reduce appetite, increase energy expenditure, and enhance glucose disposal into skeletal muscle. [12,13,14] In fact, research shows that supplementing with ALA can improve glucose clearance up to 50%! Also known as cowplant, gymnema sylvestre is a popular sugar-shuttling herb extensively researched for its ability to enhance insulin function. The results of gymnema’s actions in the body result in superior blood sugar regulation, decreased body mass index (BMI), and improved body composition. Novel research published in the August 8, 2013 New England Journal of Medicine (NEJM) article, Glucose Levels and Risk of Dementia suggests, higher glucose levels may be a risk factor for dementia, even among persons without diabetes. Other research has shown that Chromax chromium picolinate supports brain glucose transporter function and contributes to improved glucose metabolism, significantly improving cognitive function. Chromax chromium picolinate has been affirmed as Generally Recognized As Safe (GRAS) for use in food and beverage products for more than a decade and was affirmed in November 2012 GRAS for use in foods at daily doses up to 2,000 mcg of chromium. It is one of only a handful of marketed ingredients to have secured this status at clinically effective doses. Chromax is approved for use within the United States, European Union, Canada, China and numerous other important markets throughout the world. Chromax compositions and/or uses are protected under U.S. patents: 5,789,401; RE 39,480; 5,877,171; 5,898,036; 5,914,326; 5,92,066; 5,948,772; 5,972,390; 6,034,125; 6,093,711; 6,136,317; 6,143,301; 6,251,889; 6,329,361; 6,432,942; 6,471,998; 6,713,469; 6,809,115; 8,062,677; plus other patents and patents pending. 1. Kaats GR, Blum K, Pullin D, Keith SC, Wood R. A randomized, double-masked, placebo-controlled study of the effects of chromium picolinate supplementation on body composition: A replication and extension of a previous study. Curr Ther Res. 1998;59(6):379-388. doi:https://doi.org/10.1016/S0011-393X(98)85040-6. 2. Docherty JP, Sack DA, Roffman M, Finch M, Komorowski JR. A double-blind, placebo-controlled, exploratory trial of chromium picolinate in atypical depression: effect on carbohydrate craving. J Psychiatr Pract. 2005;11(5):302-314. 3. Anton SD, Morrison CD, Cefalu WT, et al. Effects of Chromium Picolinate on Food Intake and Satiety. Diabetes Technology & Therapeutics. 2008;10(5):405-412. doi:10.1089/dia.2007.0292. 10. Dong H, Wang N, Zhao L, Lu F. Berberine in the Treatment of Type 2 Diabetes Mellitus: A Systemic Review and Meta-Analysis. Evidence-based Complementary and Alternative Medicine? : eCAM. 2012;2012:591654. doi:10.1155/2012/591654. 16. Pothuraju, R., Sharma, R. K., Chagalamarri, J., Jangra, S. and Kumar Kavadi, P. (2014), A systematic review of Gymnema sylvestre in obesity and diabetes management. J. Sci. Food Agric., 94: 834–840. doi: 10.1002/jsfa.6458.